usually due to a lack of insulin. 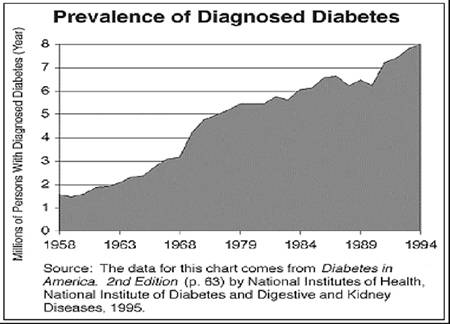 THERE ARE 16 MILLION DIAGNOSED CASES OF DIABETES IN THE U.S. TODAY. MORE THAN 5 MILLION PEOPLE LIKELY HAVE THE CONDITION BUT REMAIN UNDIAGNOSED. Because of the prevelance of Diabetes, it is a common encounter in the EMS field. We frequently deal with patients that are having a Diabetic problem. A basic understanding of the Diabetic problems and how to handle them is essential. also called low blood sugar, occurs when your blood glucose (blood sugar) level drops too low to provide enough energy for your body's activities. Can also be referred to as Insulin Shock Usually has a rapid onset. high blood sugar - food with insufficient insulin - Has a Slow onset - Also known as DIABETIC COMA. a form of sugar, is an important fuel for your body. Carbohydrates are the main dietary sources of glucose. Rice, potatoes, bread, tortillas, cereal, milk, fruit, and sweets are all carbohydrate-rich foods. After a meal, glucose molecules are absorbed into your bloodstream and carried to the cells, where they are used for energy. Insulin, a hormone produced by your pancreas, helps glucose enter cells. If you take in more glucose than your body needs at the time, your body stores the extra glucose in your liver and muscles in a form called glycogen. Your body can use the stored glucose whenever it is needed for energy between meals. Extra glucose can also be converted to fat and stored in fat cells. When blood glucose begins to fall, glucagon, another hormone produced by the pancreas, signals the liver to break down glycogen and release glucose, causing blood glucose levels to rise toward a normal level. If you have diabetes, this glucagon response to hypoglycemia may be impaired, making it harder for your glucose levels to return to the normal range. When blood glucose rises, several other problems occur. The blood becomes acidic causing a condition known as "Ketone Acidosis". Acidosis is what happens in the body when not enough insulin is available. Blood sugar is usually high at this time. Moderate or large ketones are present in the urine or blood and then build up in the body. The ketones make the body fluids more acidic resulting in total body acidosis. If vomiting, may need glasses and additional protection. How did the episode occur (MOI)? time of onset? Slow or Fast? have there been any interventions? Is the patient alert enough to be able to swallow? Have they taken their insulin? Did they miss a meal after taking Insulin? Have they vomited after eating? Did they have unusually vigorous exercise? American Diabetes Association resource center for diabetes information.